Are you looking to earn some extra money on the side or potentially start your own business? 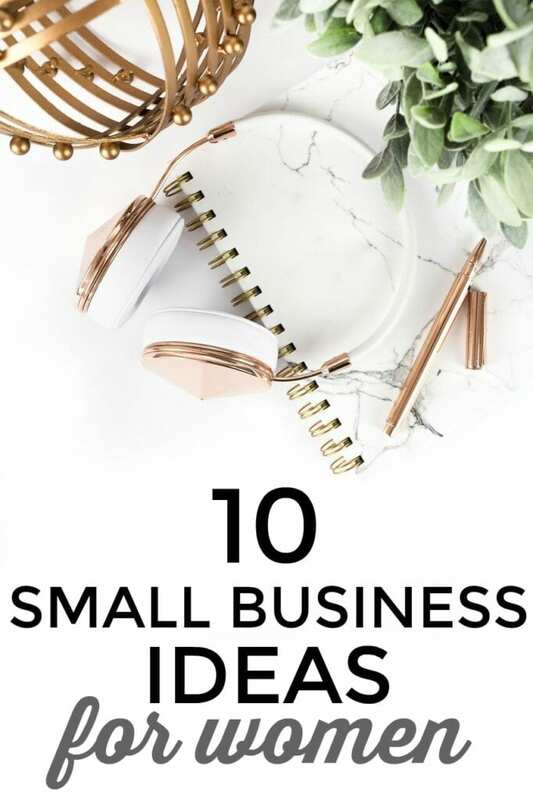 Today I want to highlight some of the best small business ideas for women to motivate you to take that first step! That’s not to say that men can’t pursue these ideas as well, but for today we’re honoring all the female entrepreneurs. 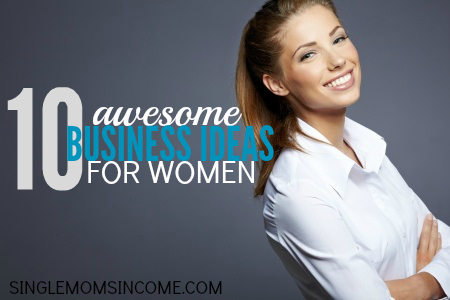 This list contains the businesses that I’ve seen women do exceptionally well with. As an added little bonus I’ve included some amazing women you can learn from no matter which business best suits you! This is an amazing program for anyone who is wanting to sell online without spending countless hours dealing with shipping. I tried Amazon FBA earlier this year and have now got my Dad’s store set up with it. If you can find products on clearance or through wholesale contracts you can make some serious cash! Just like any other type of successful money making endeavor you have to treat this like a business! (Which I wasn’t prepared for.) Learn from some who is extremely successful instead. A woman killing it with Amazon FBA – Jessica Larrew. But as with every money making opportunity goes – your own mileage may vary! Learn from someone who is now making good money from freelance writing and blogging services. Making money through blogging is seriously like the best thing ever. It’s a wonderful feeling to get paid for your words and ideas. To be honest, I recently just reignited my blogging spark after taking Elite Blog Academy (the best course EVER!! More on that later this month.) And since then my traffic has doubled and my blogging income is on a steady rise too. Here’s how to start a blog and five proven ways to make money blogging. Think software development is just for men? Think again! A woman killing it with Software Development – Laura Roeder. If you have something to teach get that idea out to the world. Create a membership site and start an online course. Learn as you go! A woman killing it with Online Courses – Ruth Soukup. I don’t have a single crafty bone in my body but if you do Etsy is the place to be! Etsy is simply a selling platform (like Amazon or eBay) that features only handmade products. The items sold on Etsy are very broad and can range from digital downloads, handmade home décor, and even clothes. If you’re a creator and want to get paid for it you need to give Etsy a try! I’ve tried my hand at affiliate marketing with niche sites a couple times and miserably failed! That’s not to say it isn’t an awesome business idea. It is! And it’s also fun. While my niche sites didn’t work out (read about that here) I still had so much fun building them and it was an amazing learning experience. Website management is a very diverse business and is actually something that I’ve ventured into rather than only freelance writing. When it comes to website management you can do everything from sell ads, edit and schedule content, hire writers, promote on social media and more. Since this is such a diverse area I wanted to highlight two women who are successful website managers but make their money in very different ways. Women killing it with website management – Alexis Grant. Does the phrase MLM (multi-level marketing) put a bad taste in your mouth? When done in a sleazy way it definitely can. But what if you’re completely in love with the product you’re selling and confident that it helps other people? Well, in that case you make a lot of money promoting a product you truly love. There are many companies who hire independent sales rep – Avon, Scentsy, Beach Body, and a whole lot more. Some of these companies require you to host parties and make commissions directly off of your sales. Other companies will influence you to get people to sign up as coaches underneath you and you’ll receive a percentage of their sales. In short that’s how MLM works. I’m a total dog lover. (Sorry, cats.) If you are too you can start a pet sitting business. To be honest I never really understood how a pet sitting business could be profitable until following Crystal’s journey. And let me tell you, she is doing pretty awesome with the pet sitting business! A woman killing it with pet sitting – Crystal Stemberger. The women I’ve featured here are every day women just like you and me. They’re not celebrities and they weren’t handed their success on a platter. They worked for it. If you’re an aspiring entrepreneur I want to encourage you to pick your business idea and take that first step today. Then take another step tomorrow, and another step the next day. All those small steps will add up and you’ll eventually get to where you need to be! 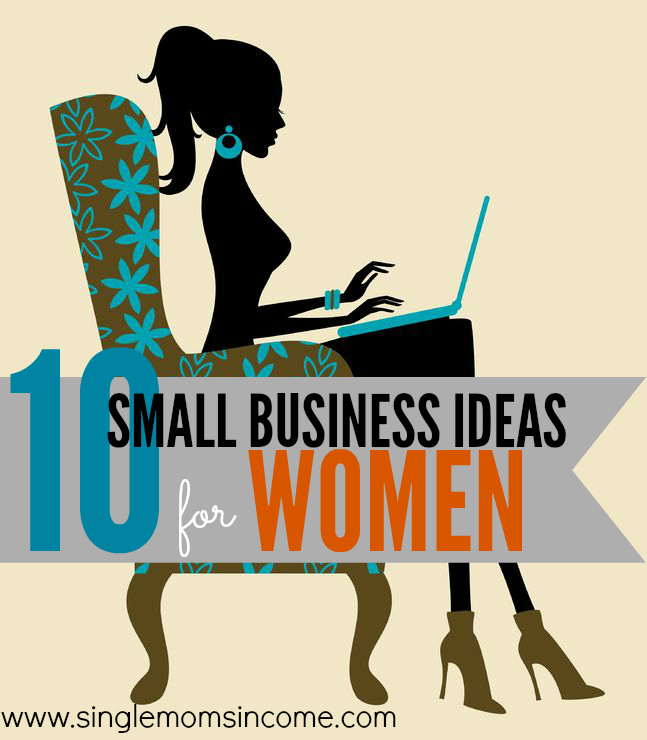 What’s your favorite business idea for women? P.S. If you want to learn from some of the best women in the business I highly recommend you check out the Work at home Summit. This summit is a collection of entrepreneurs talking about a myriad of different work at home businesses they’ve started and grown. This is 100% the best work at home event I’ve ever seen. (Totally scam free.) And it’s free. You can find out more here. I read Ruth’s blogging book, but didn’t realize she had a course. I’m interested in that but also interested in running an online store, so I’ll have to weigh what I spend my money on! The other thing I would add to the list is follow a passion. I haven’t done the best job of this, but I still know there is money to be had. I used a particular childbirth method and I got certified to teaching because I loved it so much. I let that certification lapse – oops! I also love fitness and I can get certified to teach classes or own a number of very low cost franchises. Ruth’s course is awesome. You’ll have to check it out next time. Yeah I personally don’t feel like you have to follow a passion. I think you have to enjoy what you do but I personally feel like every time I follow my passion I get really burnt out and lose that passion. Plus, I kind of feel like my passion is family and therefore I try to do what I’m good at but that I also enjoy, to allow myself to earn enough money to be able to be there for my kids. I guess to sum it up having work that allows me to take care of my kids and really be there is my passion. Wow I could not have said it better. I experienced burnout following my passion early in my career and I haven’t looked back! I’m happier now and looking forward to starting a new venture. Thank you for this awesome list of ideas! I totally agree. Passion is not necessary, however, you do have to like what you do. Like you stated, your passion could be providing a better life for your family. I love this blog post because it gives people a place to start and you tell them where to go to get more information. I see too many bloggers who are afraid to give out resources because they don’t want people leaving their blog. If it’s in the best interest of the reader to go elsewhere to get more info, then you should put up the resources. People will come back to your blog if you’ve provided valuable resources. Again props on writing a very good article. Keep up the awesome posts! I am with your with Ruth. I read her book and was about to sign up for the course but is full. 2 years and I enjoy looking after the elderly , and I would like to work as full time Carer I live in Hertfordshire area, Sleepover all nights Carer I will do. Love this list. All such inspirational women! Thanks for sharing! For me, the tricky part is sticking with something and seeing it through. I have more ideas than I can focus on, so making things happen is hard. I’m starting to get close to finished my first ebook, yay! I think the second one will be easier, due to the learning curve on the first one. Here’s hoping, anyway. You and me both! That is my exact same problem. I’m always flooded with ideas and tend to lose focus. Congrats on getting that first ebook done though. That is huge. I need to get mine done, too! Am excited to see your post on the Blog Academy. I just started out and am looking for anything to get me started. I’ve done freelance writing for years and love the job board at Problogger. It’s by far the most professional and reliable I’ve seen. Much more likely to actually get something there than one of the mass market freelance sites. Website management is a good one too. After spending so much time learning how to manage my own sites, I wish I had just gone with a good assistant. I know some bloggers and freelance writers and they are already quite accomplished in their field. It’s amazing how someone’s gift in writing can become a lucrative business venture and can actually change lives. This is a fantastic list of ideas. It’s amazing what is possible now using the internet. What a cool post! Thanks for the mention — and for the link, since I wouldn’t have stumbled upon your blog without it! Hi! You may interested on MLM..I could recommend USANA..You will surely love the products and so with the compensation plan.. The company is listed in the NYSE.. This is so helpful, Alexa! Thank for putting this list together. I’ve never heard of Amazon FBA, but now I want to look into it. Bookmarking this post! The Amazon FBA is a great tool I didn’t know about, will recommend this to a friend who runs an eCommerce store! I found your blog on Pinterest, You are preaching to the choir about working from homructore. I used to work from home as an online instructor, but recently went back to work this week. I still teach online and just started a new blog with a colleague/friend. I want to eventually get back out of the workforce running my own business. I hope we can connect as fellow bloggers. I was reading alot of what Michelle Gardner had on her blog and I got tired because I didn’t find anything on there that would help me start my own blog. I see where she promotes people to make a purchase in order to create your own blog but does that really help? Anyway doesn’t Google have a blog section for free? If you’re talking about Blogger, yes it’s free and you can sign up through Google. I think it’s important to mention though that most people who start blogging with a free platform like Blogger, Wix.com or WordPress.com do eventually switch over to a self hosted platform if they want to grow their blog. This is why it may be best to just start self hosted with Bluehost, GoDaddy etc. and purchase a domain name. Glad to hear you are considering starting a blog though, that’s awesome! Good luck! Please can you provide business ideas for Teen! Thanks for the comment. That’s a great idea for a future post and we will keep it in mind. I found your site very interesting. AMAZON FBA I never heard about it actually but it sounds very interesting and that’s what i’ll try to find out. Thanks for your post. I love the way that this blog includes examples of women who have achieved success in the different home-based businesses you’ve listed here. When your readers see that someone else has done it, it raises the question “Why not me?” Taking that first step is the hardest thing for a lot of aspiring entrepreneurs, so it’s helpful and inspiring to show how others have done it. i’d like to start an online magazine. but don’t know how to start it. This article might help offer some guidance with this: http://college.usatoday.com/2014/04/16/5-tips-for-launching-your-own-digital-magazine/ Good luck! I want to start my own training, consulting and counseling business. Great list! There are a lot franchises out there that are home based that have significant earning potential. In some cases up to 6 figures depending get on your interest, skills and investment capabilities. Buying a franchise is a great way to be in business for yourself, but not byet yourself. Plus many of them offer discounts on the franchise fee for women! That so wonderful,i would like to venture into selling on Etsy..
Good ways of utilising time at home for girls as well as ladies as part time jobs. i really find all the ideas interesting and I love to express my life on writing.And do we need money to start blogging ! Hey Dona, You can start a professional blog for only $12 for your first year https://singlemomsincome.com/how-to-start-a-blog-with-godaddy/ Everything esle you need for your blog can be found/learned for free. Hope that helps! I really liked the information. I have been thinking of starting a blog but I was wanting to do weight loss/fitness. Fitness used to be my passion and was hoping a blog would help me out. Does anyone have an opinion about this type of blog? Was hoping to earn money off of this, is it possible? It’s definitely possible! In fact, I would say that’s a hugely profitable niche if you can build up a good readership. how do i creat a membership site… i ve been looking for ways to do that. I really liked the information. I have been thinking of starting homemade craft. I’m honestly not sure. Sorry! Hey, It’s an interesting read. Great ideas shared by you. I have just started my blogging career. Let’s hope it goes in the right direction. Thanks. Do you have more info on how to start a online training course? I offer Microblading courses and love the idea of a online course! I don’t personally have any info on it. A lot of the people I know use Teachable as a platform for setting up a course. I’ve messed around with Teachable a bit and does seem fairly easy to use. I would Google a bit though for some demos/recommendations. As a young self-employed mum of 1, I have struggled with getting some sort of balance. I also at times say no to social events to avoid being tired on the weekends, when I like to enjoy walks and Pilates (and squeezing in a little work here and there)- I have felt guilty about not attending social engagements up until recently when my business really started to kick off, now I know I am making all the right decisions and doing what I love, all the time! Have just stumbled across your site and LOVE it! Have found so much useful info as a social media manager and consultant- will continue to be a reader for sure. Thanks and best of luck to you! Hey Alexa! Thanks for the mention 🙂 I just found your site and it looks awesome. Amazon FBA rocks, and has seriously changed our lives for the better. I greet you Jesca in the name of our living Lord jesus christ,I am David from AFRICA.